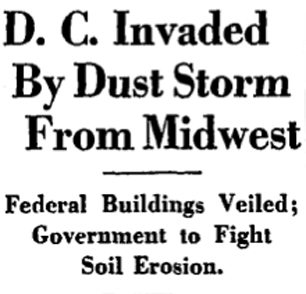 “DC Invaded By A Dust Storm From Midwest,” Histories of the National Mall, accessed April 25, 2019, http://mallhistory.org/items/show/274. In March 1935 a dust storm hit Washington, DC, caused by soil erosion in the midwest in what came to be called the Dust Bowl. Washington had already experienced at least one dust storm, in May the previous year, but this storm had special timing. It hit on the day Hugh Bennett, Director of the Soil Erosion Service, testified before Congress for the need to continue funding the program, which worked to stop the erosion causing the dust storms. Washingtonians saw firsthand the impact of soil erosion as dust covered the Mall and city and Congress approved changes. Creeping halfway across the Nation in a murky cloud extending 10,000 feet into the sky, the great dust storm of the Southwest and Midwest invaded the East yesterday, bringing grime and discomfort on the first day of spring. Even as the Administration determined upon a combined drive by seven government agencies to fasten the Midwest's rich farm soil against the destructive dust storms, the swirling particles of earth from Kansas, Oklahoma and Texas sifted into the District and dirtied the windows of Federal Buildings. To a large extent the storm, which traveled at an estimated speed of 35 miles an hour, passed to the north of the Capital, but by late afternoon it was distinctly visible here. A clay-colored veil hung before the Washington Monument, the Lincoln Memorial, the Capitol and the Library of Congress. Washingtonians took the dust storm calmly. Throngs of curious persons, leaving Government officers, swarmed down the Mall and to Potomac Park, where the dust was visible.